Do you have an algae problem? Can't seem to get your water clear? Then you might want to consider using Algone. Algone is an effective water clarifier and nitrate remover for all types of tanks. If you have a freshwater, saltwater or reef aquarium, Algone will work for your tanks. Algone creates crystal clear water and prevents common problems. It helps removes nitrates and other waste and toxins. 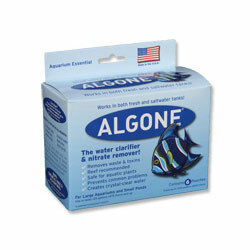 Algone is 100% chemical free and safe to use in all types of aquariums. You can purchase algone directly at Algone.com. I’ve been using this product for the past 6 months and it does really work. I’ve had really bad algae issues and until I can get around to redesigning my tank, I needed a solution to this problem. 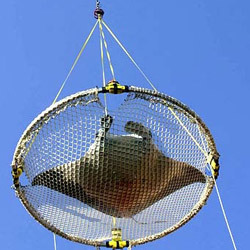 It was getting tiresome trying to clean the algae every other day. So I went and purchased Algone. It’s in a white pouch which you put into your tank (or in my case, the sump). Within a few days, I visually noticed that algae was growing slower and disappearing. While this was happening, the white pouch became brown and grew bigger (kinda like a bag of popcorn you put in a microwave). If you’re having algae issues (most likely due to nitrate issues) or unclear water, then try Algone. It worked great for me. This product is no good ! even after i did everything and waited and waited and waited for clear water it never happend and i tested my water eveyrthing said it was fine but not clear know matter what i did. This prducts seem to put more bad cloudy cover – color in my tank that would never go away. then when i called the company that makes algone they seem not to have a record of me even buying it from them how nice ! i guess in my experience it does work. the bag themselves get really big and dirty so it must be doing something. it’s better than nothing and if it works as described, it’s the most simplest and convenient way to keep nitrates down and keep your tank clean. I have been using algone so far for one week and no drop in nitrates at all Im going to see if it works over a long period of time I have heard that you need to change it every week when you have a really bad nitrate problem Mine are at about 40 Any suggestions? It is a salt tank.